→Too late for martial law victims’ campaign vs Bongbong Marcos? 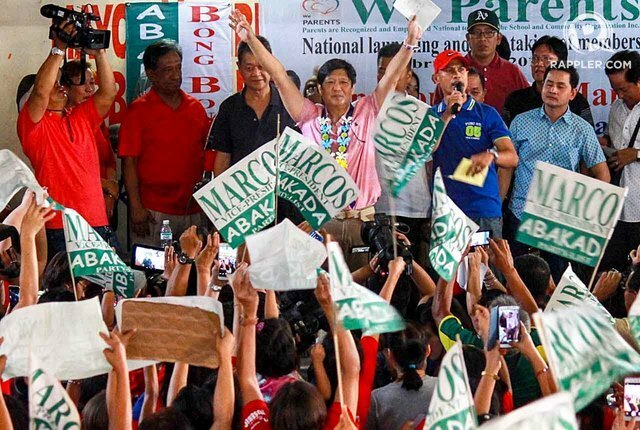 MANILA, Philippines – Martial law victims who have vowed to hound the vice presidential bid of Senator Ferdinand “Bongbong” Marcos Jr said they are not losing hope despite the rise in pre-election surveys of the late dictator’s son. Carmma or the Campaign Against the Return of the Marcoses to Malacañang was launched on February 4 – days ahead of the start of the campaign period. They vowed to picket Marcos activities and distribute materials detailing the abuses and excesses of the regime of the late president Ferdinand Marcos decades ago. 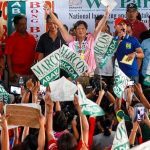 Two weeks and at least 5 provincial visits into Marcos’ campaign, the group seemed to have a lot of catching up to do to accomplish its mission. Spokesperson Bonifacio Ilagan acknowledged that they are running out of time in campaigning against Marcos Jr. They just met with their regional counterparts during their national assembly on Monday morning, February 22. With at least 800 members, the group will continue fighting: “Kami naman po walang katapusan ang pag-asa (We have not stopped hoping) even during the darkest days of Martial Law when all forces of the dictatorship were against us,” Ilagan said. Carmma, Ilagan said, will ramp up its efforts and work faster given it only has at least two months to overturn the warm reception of Filipino voters for Marcos. Their immediate response will be to roll out statements and videos on social media in the days leading to, and even after, the 30th anniversary of the EDSA People Power Revolution this week. “Our materials are all set for distribution. We will do our best to reach the farthest areas. We have our statements, we have our video materials,” Ilagan told Rappler in a phone interview. They will also be pushing the senator to engage with their party to discuss the issues about the plunder and several human rights violations committed during the time of his father. Ilagan said the group’s local chapters will be countering Marcos’ provincial sorties. He said that they are counting on their units in Southern Tagalog, Central Luzon, Panay Islands, Davao, and the National Capital Region. Out of these areas, the senator has visited Batangas in Southern Tagalog, where he has strong support in at least 5 municipalities. Marcos is set to visit other provinces in the region in the coming days – Cavite, Laguna, and Rizal, in particular. Pre-election surveys, and even in campaign sorties, show that Carmma has a lot of work to do if they want to succeed in frustrating Marcos’ vice presidential bid. The most recent Social Weather Stations (SWS) survey showed that Marcos is tied at the top spot with fellow senator and Nacionalista Party member Francis Escudero if elections would be held today. His reception in Luzon areas, based on Pulse Asia survey, is also promising. 36% of voters in the National Capital Region and 26% in balance Luzon said they would vote for him. He has also been received well by residents of the first few local areas he visited, where the “Marcos fever” is still very visible in many senior citizens, who reminisce about how life was better in the Philippines during Marcos’ rule. n Metro Manila, the family scion has been visiting areas where his parents set up urban relocation centers such as in Marikina, Caloocan, and just this Monday, Muntinlupa City. Marcos Jr is shrugged off the campaign against him as part of politics. “We are candidates, so ganyan naman talaga ang pulitika, merong sumusuporta, merong hindi. Lahat naman ng kandidato may ganyan,” he told reporters during the sidelines of a brief program in Muntinlupa City on Monday.